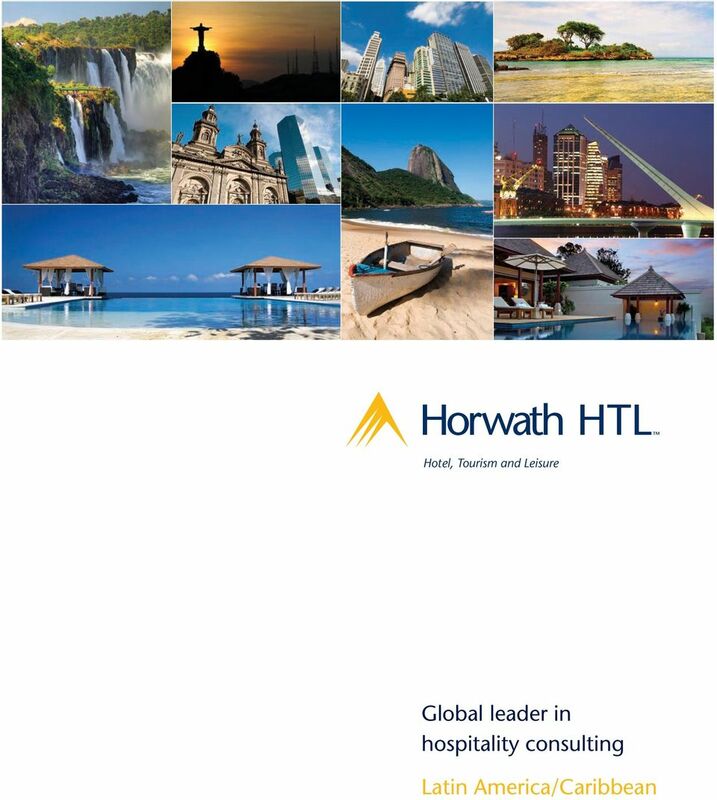 Download "Hotel, Tourism and Leisure. 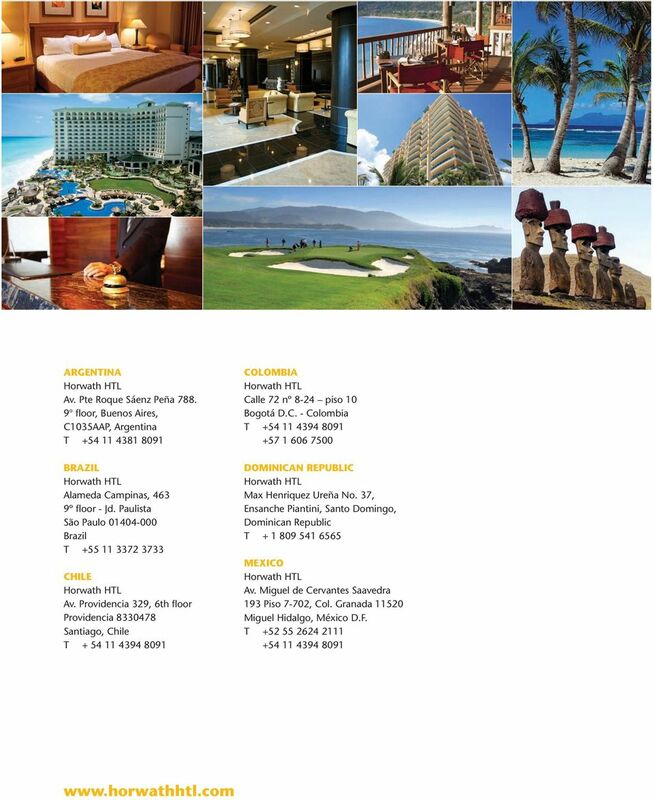 Global leader in hospitality consulting. 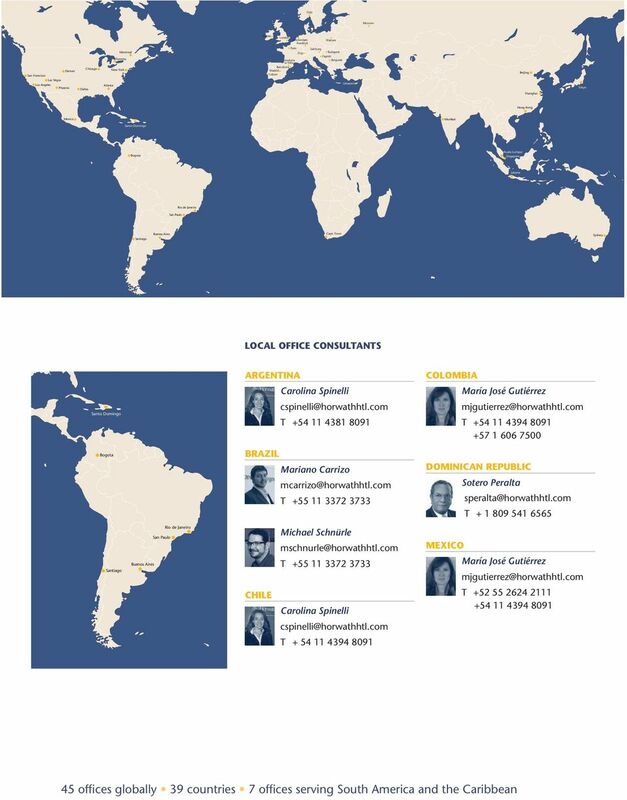 Latin America/Caribbean"
5 ARGENTINA The office has broad experience in different types of projects including mixed-use developments, luxury and budget hotels, tourism and the Public Sector. Recently, the office has led projects in Chile, Colombia, Costa Rica, Peru, Ecuador and Uruguay working with renowned developers and hotel chains. Scope of services includes: analysis of projects under development and valuation and asset management. BRAZIL Brazil is the most important market in South America. The office has expertise in all different stages of hotel development and management. The local offices, Sao Paulo and Rio de Janeiro, have developed market studies around the country and have a strong team that works alongside the development teams of a variety of investors and hotel chains. CHILE Supported by the Argentina office, Chile has been developing projects since Market research, financial feasibility studies and a thriving Public Sector business make up the majority of work undertaken in Chile. The office has developed several projects that look at enhancing tourism in different areas of the country through investment attraction plans and strategic planning. COLOMBIA Colombia's office is focused on both the private and the public sector. It has the support of the local network of 6 Crowe Horwath offices in Bogota, Barranquilla, Cali, Cartagena, Manizales and y Medellin. 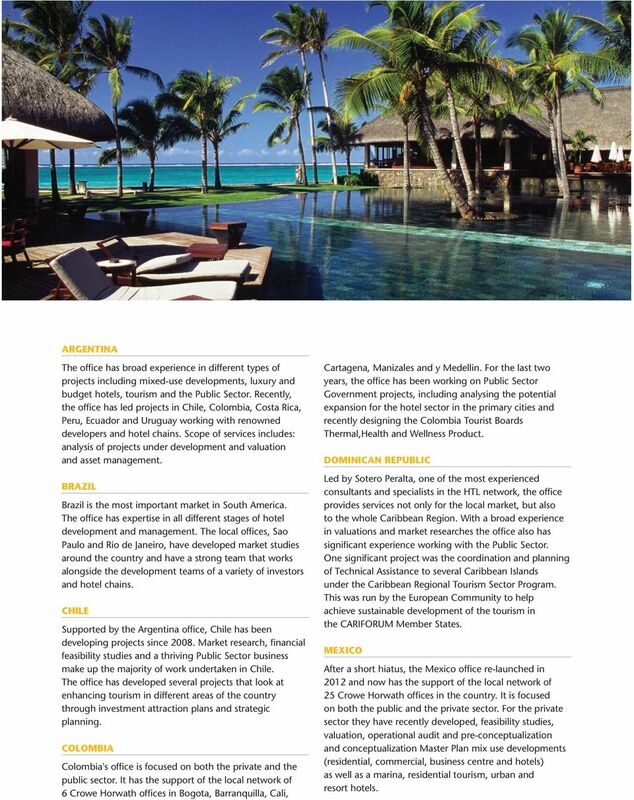 For the last two years, the office has been working on Public Sector Government projects, including analysing the potential expansion for the hotel sector in the primary cities and recently designing the Colombia Tourist Boards Thermal,Health and Wellness Product. DOMINICAN REPUBLIC Led by Sotero Peralta, one of the most experienced consultants and specialists in the HTL network, the office provides services not only for the local market, but also to the whole Caribbean Region. With a broad experience in valuations and market researches the office also has significant experience working with the Public Sector. One significant project was the coordination and planning of Technical Assistance to several Caribbean Islands under the Caribbean Regional Tourism Sector Program. This was run by the European Community to help achieve sustainable development of the tourism in the CARIFORUM Member States. MEXICO After a short hiatus, the Mexico office re-launched in 2012 and now has the support of the local network of 25 Crowe Horwath offices in the country. It is focused on both the public and the private sector. For the private sector they have recently developed, feasibility studies, valuation, operational audit and pre-conceptualization and conceptualization Master Plan mix use developments (residential, commercial, business centre and hotels) as well as a marina, residential tourism, urban and resort hotels. 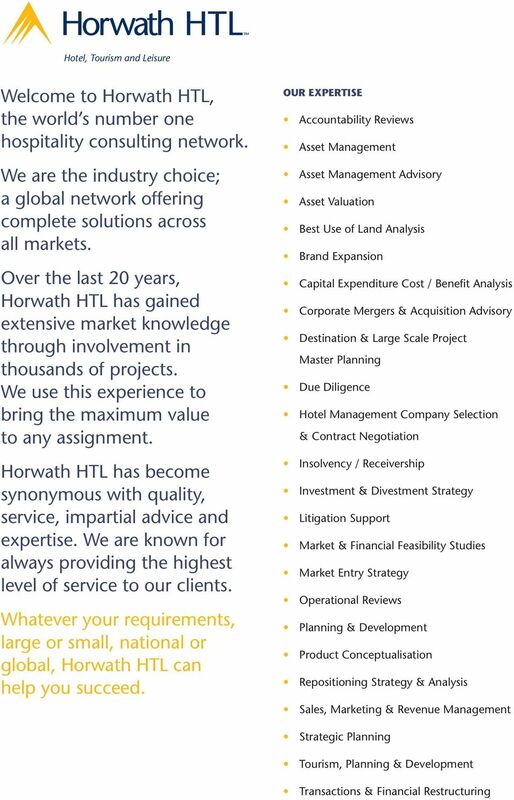 6 HORWATH HTL KEY SERVICES Asset Management Asset Management teams work to create and protect value. Our experts work along side owners, protecting their interests and maximizing returns on their investments. Business Recovery has developed a range of products to help businesses navigate the difficult waters of a global economic downturn. Our Hotel experts provide support in all areas. Planning & Development Planning & Development services are the cornerstone to any successful hotel project. 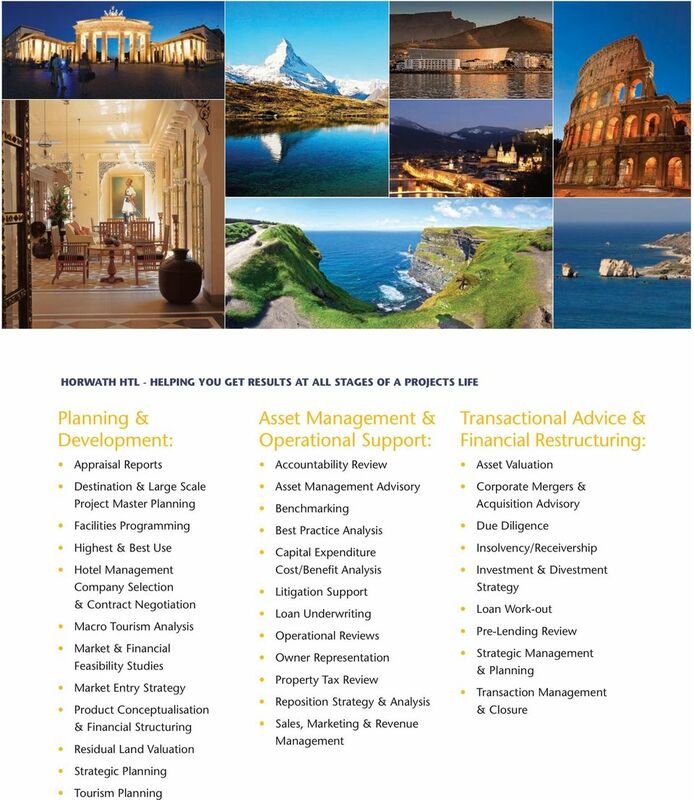 Our international team of hotel experts can advise and navigate through all areas of hotel development. Tourism & Leisure has some of the world's foremost experts in Tourism & Leisure development. We have a system for all aspects of your project. Transactional Advice is skilled at guiding investors, lenders and owners through the complex nature of acquisition and disposal transactions, with experience of successful hotel financing and transactions of all sizes. Valuation Valuation Services have valued Hotel properties all over the globe. 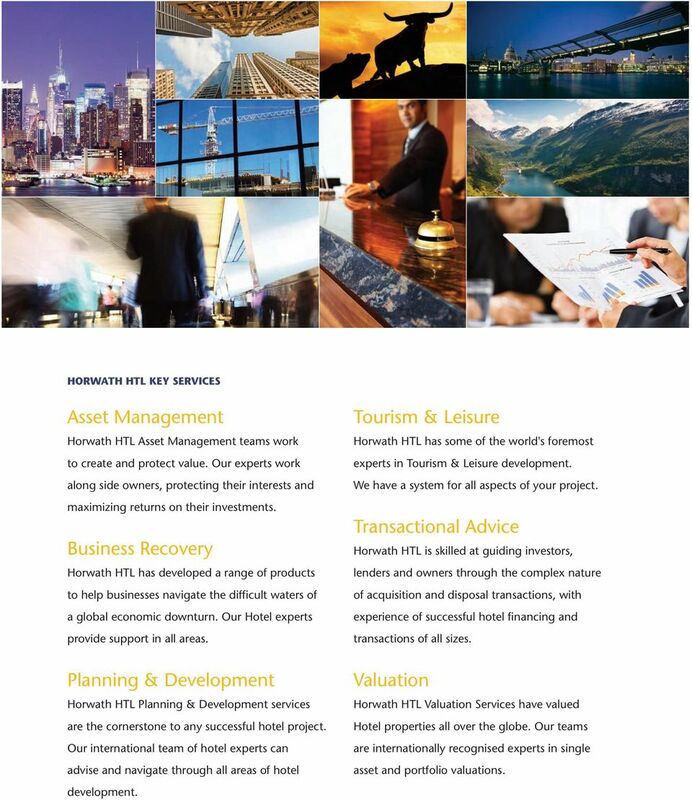 Our teams are internationally recognised experts in single asset and portfolio valuations. 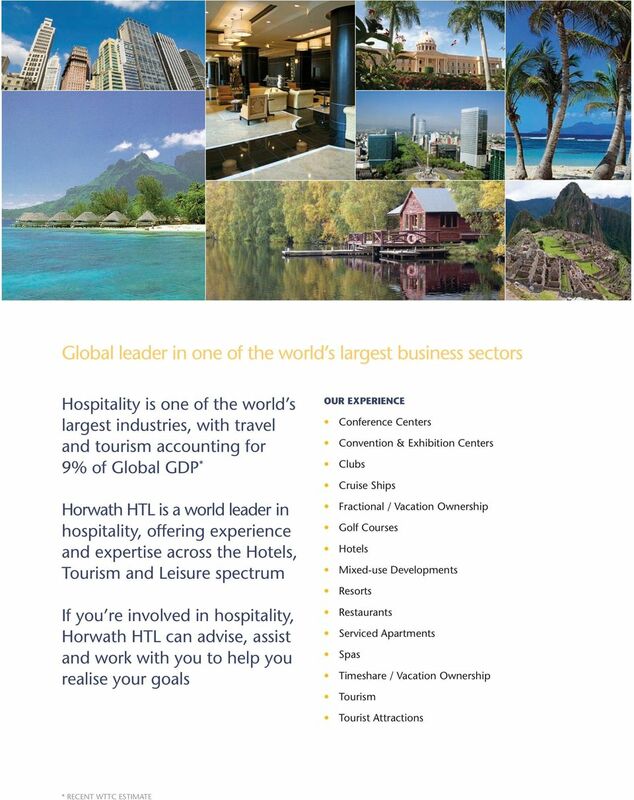 TM Hotel, Tourism and Leisure The global leader in hospitality consulting Croatia/Serbia (SEE) TM Hotel, Tourism and Leisure Welcome to Horwath HTL, the world s number one hospitality consulting network. Real Estate. Expertise of a boutique. Reach of a global firm. Opportunities for Action. Shared Services in Operations and IT: Additional Complexity or Real Synergies? HYBRID CLOUD Why is it important & how do you manage it? Colombia is good with words. See it for yourself in the Frankfurt Book Fair 2011. The Real Supply Chain Challenge Leadership and Talent Management The best supply chains appear to be complex, precise machines with millions of moving parts that mesh efficiently and function flawlessly. Travel, Hospitality and Leisure Sector. Expertise of a specialty. Reach of a global firm.